There is a right way and a wrong way to dispose of our nuclear effluence and I'm pretty sure just dumping it into the Columbia River isn't the right way. Plutonium takes a closer look at the economic and environmental costs of our Cold War arms race. In January of 1943, General [Leslie] Groves commandeered 670 square miles, much of which was farmland, in Washington State on the Columbia River. The people whose land was taken were not told the reason, but they were allowed to harvest one more crop. Groves had an emotional attachment to the river in which he had fished as a boy. Above all, he was determined that no harm would come to the salmon. From 1943 to 1945, the construction project, which involved some 30,000 workers, cost about $350 million. They built 386 miles of highways and 158 miles of railroad track and poured 780,000 cubic yards of concrete. Nothing industrial on this scale had been built before and certainly not in such a very short time. The DuPont Corporation oversaw the enterprise. By 1963, nine plutonium production reactors had been built. When the last of them was shut down in January 1987, they had produced 67.4 metric tons (67,400 kilograms) of plutonium, of which 54.5 metric tons were weapons grade. This plutonium would make about 35,000 pits for bombs. In addition, five heavy-water–moderated reactors were built on the Savannah River Site, near Aiken, South Carolina, between 1953 and 1955. Until they were shut down in 1988, they produced 36.1 metric tons of plutonium. Given General Groves's concern about the Columbia River and its salmon, considerable thought was expended as to how to avoid damage to both. Eight of the production reactors — the last one starting up in 1955 — made use of Wigner's design for the cooling system. Water from the Columbia flowed through tubes that passed through the core of the reactor and then returned to the river — "once-through cooling." 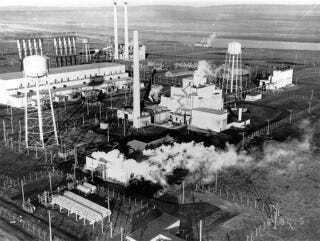 It was understood that some radioactive isotopes would be produced and that the water would be greatly heated. In fact, when the water left the reactor, its temperature approached 200°F. To deal with these issues, retention pools were constructed into which the effluent water could be put temporarily before it was returned to the river. The pools were designed to hold the effluent water for two to six hours. It was recognized that when it was released, the water would have a temperature higher than that of the river and there would still be a residue of radioactive isotopes that had not decayed. The expectation was that the returned water would, nonetheless, meet acceptable environmental standards. This did not happen for at least two reasons. Making plutonium during the Cold War was considered so urgent that the time the effluent water spent in retention pools was reduced to as little as 20 minutes. This aside, no one had predicted the sort of radioactivity that was actually produced. In the first place there were chemicals in the cooling water. Some of these chemicals came from the river and some had been added to keep the pipes in the cooling system clean; for example, some 25 to 40 percent of the phosphorus,which after irradiation became the isotope phosphorus-32, was from the cleaning chemicals. Phosphorus-32 has a half-life of 14.3 days and, if one is exposed to it in sufficient amounts, can lead to bone cancer. To get an idea of the amounts of radiation that were involved, we need to introduce a common unit used to measure radioactivity: the curie. Originally, the curie was the number of disintegrations per second — 37 billion — of a gram of radium. But after much negotiation with Madame Curie, it was given the universal definition of 37 billion disintegrations per second of any radioactive isotope. To set some scales, a pound of uranium-238 has 0.00015 curie of radioactivity, while the isotope cobalt-60 has nearly 518,000 curies. Estimates have been made of how many curies of the various radioactive isotopes produced by the Hanford reactors were ultimately released into the river. The estimated amount for phosphorus-32 was some 230,000 curies while, for example, about 6,300,000 curies of neptunium-239 were released. Some of this came from irradiation of the chemicals I just mentioned, but much of it came from the stress on the fuel elements, which increased when the reactors were ramped up to produce more plutonium. The metal coverings of the fuel elements sometimes split, allowing chunks of the radioactive fuel, some weighing up to a pound, to leak out and be flushed into the river. It is said that there were nearly 2,000 such episodes during the lifetime of the eight reactors. How dangerous was all this to people who swam in the river, drank its water, or ate its fish? The fact is that no one knows for sure. But it is also a fact that while the Hanford reactors were running, it was a policy not to warn people about fishing or swimming or drinking the water downstream from them. One did not want to cause panic. As disturbing as this may seem, it is nothing compared to what happened on land. The river, after all, if it does not suffer further pollution, would eventually heal itself. There was no way this was going to happen on land and there was, and still is, a concern that groundwater would be affected and that it could leak into the river. This is such an enormous and emotional subject that to do justice to it, if justice can be done, would require another and different book. Here, I give an abbreviated chronology that will convey the general idea. In 1989, the Department of Energy (DOE) decided to try to clean up 54 million gallons of radioactive waste stored in 177 underground tanks at the Hanford Site, some of which were leaking. The idea, which was abandoned in 1991, was to solidify some of the waste. It was proposed that year to vitrify the waste — turn the tanks into glass. This plan in its original form was abandoned two years later, since it could not treat the waste fast enough. In 1995, DOE decided to privatize the project by contracting British Nuclear Fuels to do it. The contract was canceled five years later, and the Bechtel Company was hired to speed up the vitrification. Bechtel was awarded a $4.3 billion contract, which in 2002 was increased to $5.8 billion as an incentive to complete the project by 2011. In 2005, it was estimated that it could not be completed before 2015, and part of the construction was halted because of concerns about earthquake safety. The present estimate is that the cleanup will cost about $9.65 billion and will require the further man-hour equivalent of 2,300 engineers working full-time for a year. Some progress has been made. The spent nuclear fuel rods have been removed from the retaining ponds where they had been stored, and the radioactive sludge in the ponds is in the process of being cleaned up. General Groves died in 1970, so he is not available for comment. Rocky Flats served an entirely different purpose. In 1950, President Truman ordered a crash program to build a hydrogen bomb. Rocky Flats, which is located on 384 acres 16 miles northwest of Denver, was created to manufacture the finished plutonium pits, which were anticipated to be needed as triggers for the then-stillhypothetical hydrogen bomb and above all for the expansion of the fission bomb program. The finished pits were shipped to the DOE Pantex Facility near Amarillo, Texas, for final assembly. As of July 1994, that facility housed some 6,000 pits. It holds more now, some of which are 33 years old. Pits age from both the inside and the outside (Figure 18, below). On the outside there is chemical corrosion, and on the inside there is radioactivity. One of the concerns is that these two processes will upset the stability of the alloy of d-phase plutonium with gallium. This is a major weapons concern in stockpiling these pits, and much research is being devoted to solving the problem. This research is hampered by the fact that the cohort of plutonium experts is also aging and that, since bomb tests have stopped, the results must be computer simulated. How certain these computer-simulated results are, I am not sure. From 1952 to 1975, Rocky Flats was managed by Dow Chemical, but not without serious environmental problems that caused it not to bid to renew its contract in 1974. From 1975 to 1989, when it was closed, it was managed by Rockwell International. Rockwell's tenure at the plant did not end happily. On June 6, 1989, the FBI raided the plant and seized records that purported to show various criminal practices involving negligence and mismanagement. The company eventually pled guilty to 10 counts, including violations of the Clean Water Act, and paid a fine of $18.5 million. That September the site was placed on the Environmental Protection Agency's Superfund list of hazardous waste sites, and in February of 1992, it was transformed entirely into a clean-up site. Until then it was still making warheads for the Trident missile. In March of 1995, the Department of Energy estimated that cleaning up the site would take 70 years and cost $37 billion. It then hired the engineering firm Kaiser-Hill to do the job. Kaiser-Hill had the wisdom to bring in outside consultants, including people from Los Alamos. These people found that the science that had been used previously in planning the clean-up was entirely wrong. It had been assumed that plutonium was soluble in water, which meant that one would have to clean up all the water sources on the site. But this did not take into account the peculiar chemistry of plutonium. It is not soluble in water, but rather it collects in small particles on the ground. This vastly simplified the clean-up process, which now became a matter of soil removal. This process was completed in October of 2005 with the final closure slated for December of 2006 at a total cost of $7 billion. It will take some time to restore the landscape and to make sure that there is no further transport of plutonium. On February 14, 2006, a federal jury, after a 16-year lawsuit, found that Dow Chemical Company and Rockwell International Corporation had contaminated the private land in the neighborhood of Rocky Flats perhaps irreparably. The 13,000 plaintiffs in the class action suit were awarded $553.9 million in damages. Reprinted with permission from Plutonium: A History of the World's Most Dangerous Element, 2007 by the National Academy of Sciences, Courtesy of National Academies Press, Washington, D.C.
Jeremy Bernstein was a staff writer at the New Yorker for thirty-five years and is Professor Emeritus of Physics at the Stevens Institute of Technology. His books include Oppenheimer: Portrait of an Enigma.